The Wyoming Articles of Incorporation Profit Corporation must be submitted to the Wyoming Secretary of State when an incorporating entity is ready to attain corporate status. 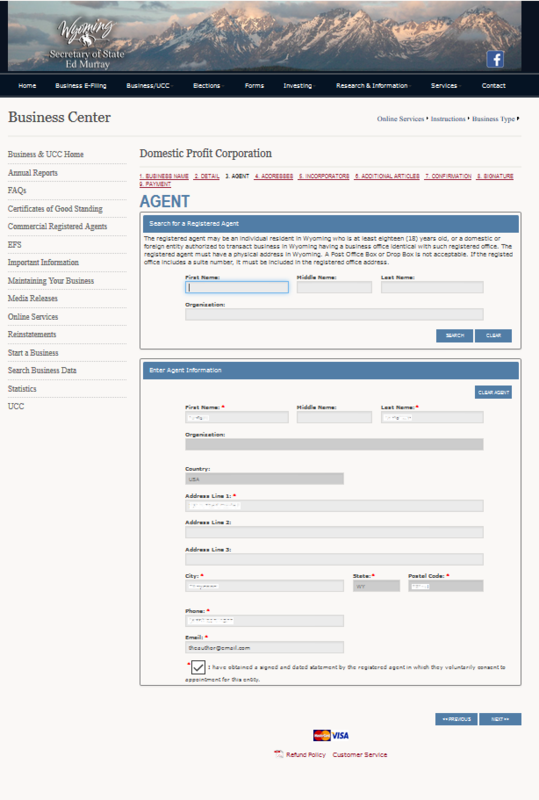 This form must be submitted as a signed original with a signed original Consent to Appointment by Registered Agent form. These documents, in conjuncture, will serve to present the minimum information that all incorporating entities must submit when registering as a corporation. The articles will contain information regarding the Identities and Locations of the Incorporators, Directors/Officers, and Registered Agent. The Wyoming Registered Agent is the party who has agreed to receive Service of Process documents aimed at the corporation he/she has agreed to represent in this matter. 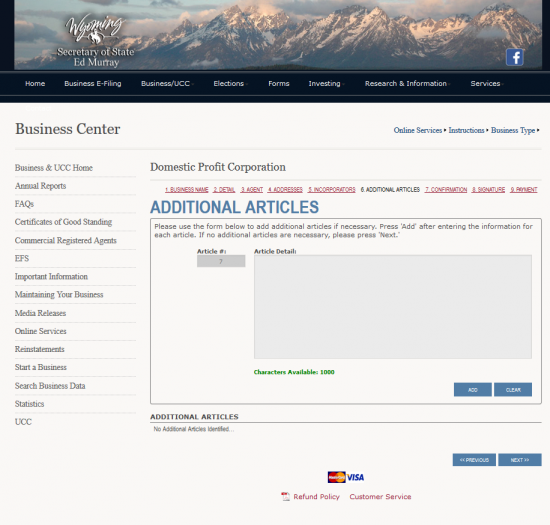 Due to the responsibility this position holds, the Signed Consent form will be required, at the time of filing, and corporations must maintain a Wyoming Registered Agent at all times. You may submit this form and these articles by mail or online. To submit by mail, include a check for the Filing Fee of $100.00, payable to “Wyoming Secretary of State.” Then, mail to Wyoming Secretary of State, 2020 Carey Avenue, Suite 700, Cheyenne, WY 82002-0020. If you submit the articles online, you may do so by going to http://soswy.state.wy.us and using a credit card to pay the applicable Filing Fee(s). Step 1 - You may download a blank Wyoming Articles of Incorporation by selecting the above “Download Form.” This file will be a PDF form thus, you will need an appropriate browser capable of filling out onscreen PDF forms or a PDF editor. If these are unavailable, you may print this form then fill it out manually. Step 2 - In Article 1 document the exact Name the incorporating entity will operate under as a corporation. This Name must contain a word of incorporation. Step 3 - If the corporation being formed by these articles is a statutory close corporation then place a mark in the check box in Article 2 otherwise, you may leave this blank. Step 4 - Article 3 will seek a definition to the Identity and Address of the Wyoming Registered Agent. This party must maintain a Physical Address in the State of Wyoming. Locate the box labeled “Name” then, report the Full Name of the Wyoming Registered Agent. In the “Address” box below this, report the geographical address for the Wyoming Registered Agent. If the Wyoming Registered Agent also maintains a separate and different Mailing Address, report this as well in the “Address” box. 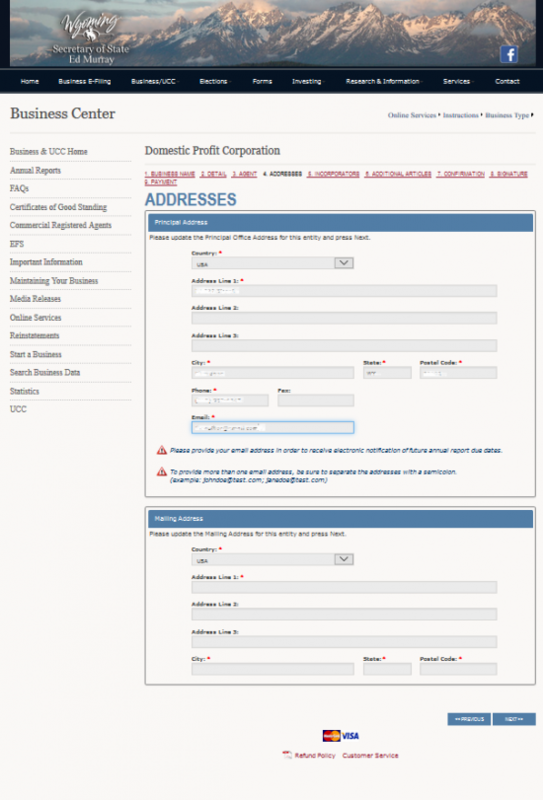 Step 5 - The Mailing Address the forming corporation will use must also be reported. Document this forming corporation’s Mailing Address in Article 4. Step 6 - The Principal Office of the forming corporation will need to be entered in Article 5. 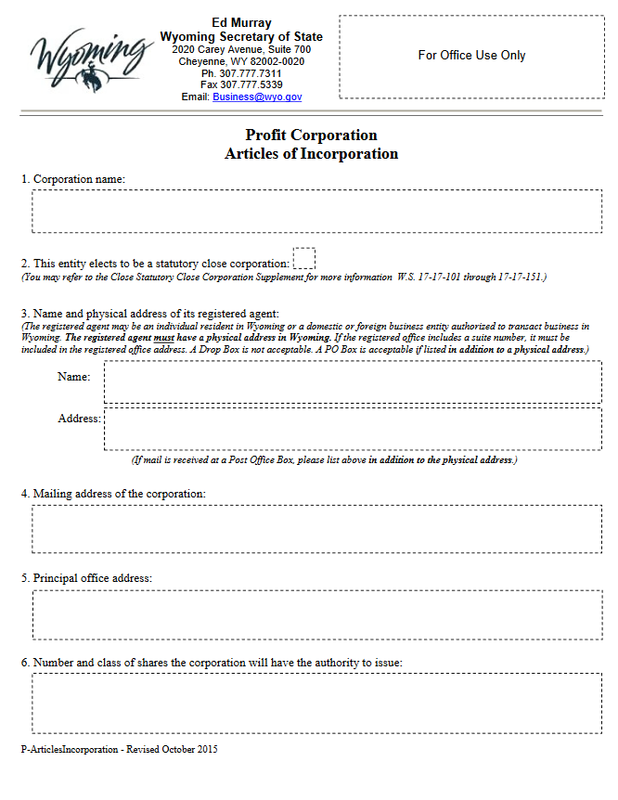 Step 7 - Locate Article 6 then enter the Total Number of Shares in each Class of Stock the corporation has been authorized to issue. Step 8- Each Incorporator must have his or her Full Name and Complete Address documented in Article 7. There will be a small table allowing for the Name of each Incorporator to be listed in the left column and the Complete Address of each Incorporator listed in the column on the right. Step 9 - All Incorporators listed in Article 7 must provide a Signature in Article 8. In addition, each one must print his or her Name below their Signature and the Date of Signature to the right. Step 10 - Next, you must elect a Contact Person with a valid Email Address the Wyoming Secretary of State may send notices to. Enter the Full Name of the Contact in the box labeled “Contact Person.” Then, enter the Daytime Phone Number and Email Address using the next two boxes. 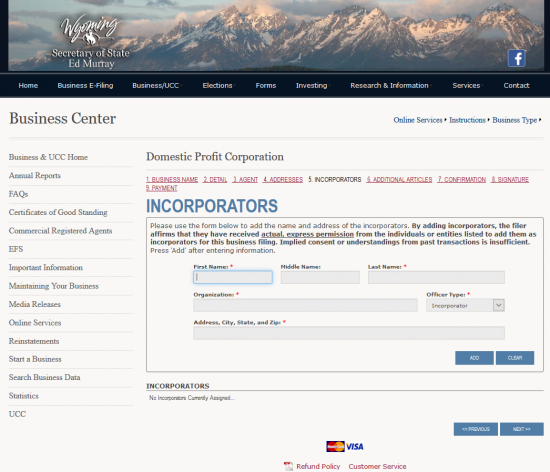 Step 10 - Once you have verified all the information on the completed Wyoming Articles of Incorporation Profit Corporation to be accurate and up to date, you may attach the Signed Consent to Appointment by Registered Agent, along with any and all required paperwork. This package may be submitted to the Wyoming Secretary of State with a check for the full Filing Fee of $100.00. 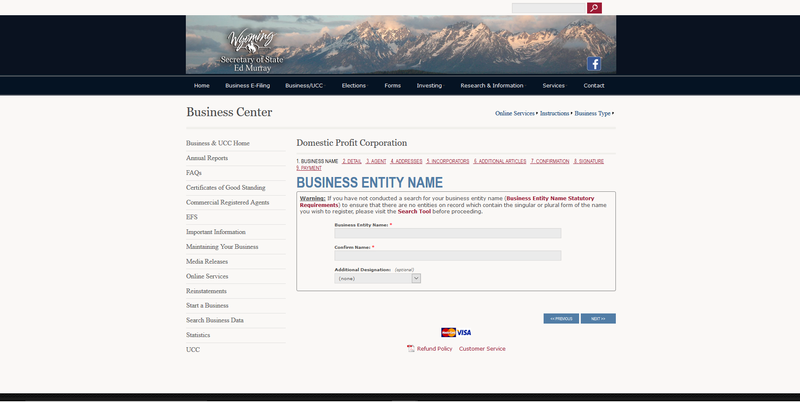 Step 3 - Locate the drop down list labeled “Business Entity Name” and enter the Full Name of the corporation being formed. You will need to enter the same Name in the field below this “Confirm Name.” Make sure to use an appropriate word of incorporation. Step 5 - In the next field, “Delayed Effective Date,” indicate if you desire the Date of Effect for these articles to be on a specific Date in the field provided. You may select any Date between the Filing Date and 90 Days after the Filing Date. If you leave this field blank, the Effective Date will be the same as the Filing Date. Step 11 - This page will provide an area where Incorporators may submit the Confirmation Signature necessary for this document. Each of the seven boxes must be read then selected by the Signature Party. The box below the Notice paragraph labeled “I acknowledge having read W.S. 6-5-308″ must be selected. 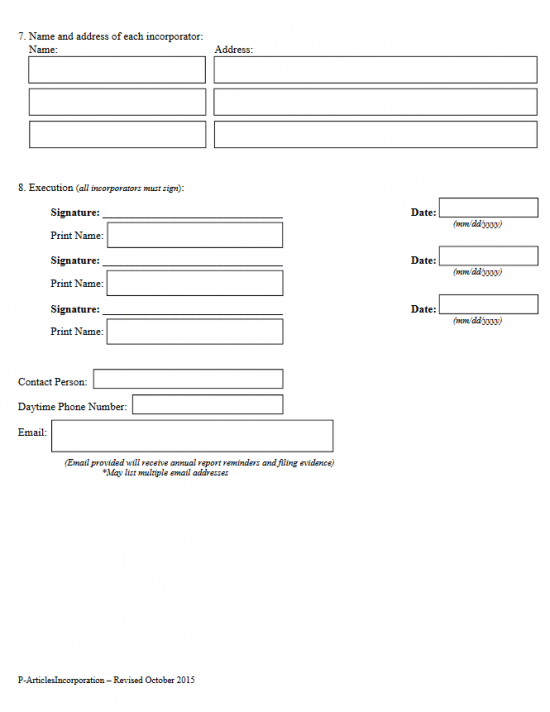 The Signature Party must then Type his or her First Name, Middle Name, and Last Name in the appropriately labeled fields, report his or her capacity in the field labeled “Title,” then report his or her Phone Number and Email (each one will have two fields as a measure to confirm this information). Once this is done, select the button labeled “Next” so that you may provide your credit card information to pay the $100.00 Filing Fee. Note: The Filing Fee must be paid in full so that this information may be reviewed and processed.